I’ve probably mentioned it once or twice before, but I have this photography site that I started last February. 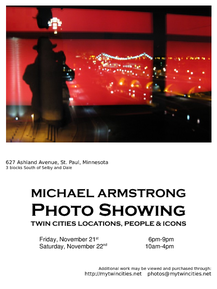 Well, with the help and encouragement of some very dear friends, I’m doing my first photo show! I’m so excited! Please click through, check out the details, and stop by! Comments Off on My First Art Show! 1966 is not a year that I remember in the least – not politically, not culturally, not musically – I was born late in the year. My only thoughts were napping, eating, and pooping. Still, this was an interesting year for music. And since I was born in 1966, it serves as a place to start. Elvis Presley, the Rolling Stones, Bob Dylan, James Brown, Johnny Cash and a host of others released albums that year. What surprised me most, however, was Booker T and the MG’s had an album that year. I always thought they started recently but, as it turns out, the band was formed in 1962. The were largely a group of studio musicians from Stax Records. I shouldn’t be so surprised that they’re still playing; after all, Dylan and the Rolling Stones are still around. But for some reason they strike me as big names, where Booker T. and the MG’s comes off as a much smaller group that, for some untold reason, wouldn’t still be around. The Beatles released two albums in 1966: Revolver, and Yesterday and Today. Both albums spawned spawned several remarkable, classic tunes: “Eleanor Rigby,” “Good Day Sunshine,” “Taxman,” and of course “Yellow Submarine” from Revolver and “Drive My Car,” “Nowhere Man,” “Yesterday,” and “Day Tripper” from Yesterday and Today. All great songs, but still neither is my favorite album from that year. The Monkees put out their first album in 1966. Despite having its roots in a television show, it went #1 in the US and topped the UK charts. “Last Train to Clarksville” was a #1 single that I remember having as a scratchy 45 at one point. I played the heck out of that song and never missed the show when it was out in syndication. Frank Sinatra and his daughter Nancy each had albums in 1966. Nancy, most notably Boots, which brought us the unmistakable, spectacular “These Boots are Made for Walkin’.” I bought a Nancy Sinatra best-of CD a couple years ago just so I could have that song. Still, with all that great music, and more from the likes of Ray Charles, Muddy Waters, Buffalo Springfield, Smokey Robinson, Otis Redding, The Animals – too many to mention, there’s one more that clearly tops them all. Pet Sounds by the Beach Boys. Pet Sounds was their ninth studio album and it changed the face of pop music. It’s even credited with influencing The Beatles Sgt. Pepper’s Lonely Hearts Club Band! The album has several seminal Beach Boys songs. Tunes that are instantly recognizable, that snap you back to a simpler time (if you’re of a certain age) or just make you feel good. Right off the top Pet Sounds starts with one of my favorite Beach Boys songs: “Wouldn’t It Be Nice.” With its many layers of harmonies and upbeat sound, it expresses some of the impatience of youth and how you have to wait for what you truly want. Even though it’s a cover of a traditional West Indies folk song, “Sloop John B.” will always be a Beach Boys tune to me. It is unmistakably summer. I play it during the winter as a sort of talisman to ward off the doldrums and hopefully bring the sunny days back more quickly. Also, I always wonder how many people have named their boats after this one song. “Let’s Go Away for Awhile” is a brilliant instrumental song, almost orchestral in its nature. You can hear the strings, saxophone, piano, vibes, and I think an oboe in there. Although just a smattering, Pet Sounds is truly a classic. I come back to it often and it really did define pop music for many years. It’s truly a must for any music collection. Most people come into their own, musically speaking, in their teens. It typically starts with a variation of what their parents listen to, then evolves based on what is popular among their friends. Sure, occasionally we’ll want to know more about the influences of our favorite bands, but that often just leads to The Beatles, The Rolling Stones, Clapton, and not much else. How often do we really go back and consider what came before? Although I turned 13 in 1979, it wasn’t until MTV† was launched nearly two years later that music really hit me. Prior to that, it was mostly stuff my parents liked: Gordon Lightfoot, John Denver, Anne Murray, Crystal Gale… You get the idea. MTV and music videos brought new wave, funk, and ROCK to the table. It was an experience that forever changed the way I listened to the world. What came before the 80’s? Who influenced the musicians I grew to love and even still listen to? Sure there have been forays into older music. A penchant for jazz and swing. The occasional dip into classical music. Even a late appreciation for the Beatles and Bob Dylan. But what came before? So I decided to take a look back; starting with 1966, the year I was born, and possibly rediscover my musical roots. The intent is more than just a list of my favorite album from each year. Along the way I’ll offer thoughts on what makes each one my favorite and perhaps some commentary about other releases from the same year. I’ll begin with 1966 tomorrow. † Yes, the M in MTV stands for music. They did actually play music at one time. I had been working on a minor redesign on the site since around the 1st of the year. About the same time Pantone announced it’s color of the year for 2008. It was a huge pile of minor changes: change the color (red #c00 -> blue #217), shrink the header area, give the “clickme” area some actual content, etc. Not a sweeping change, but dusting off the cobwebs. Then a new version of Movable Type came along which changed the template scheme again. So I started revamping my templates to the new method, couldn’t make something work right, and lost the use of a plugin I depended upon. Dejected, distracted, and disappointed, I gave up on the refresh for a while. Some time over the summer I worked with a buddy of mine to crank together a couple Web sites. They were each part blog, part static pages, but the main goal was to have a usable template and let the blogging engine do the heavy lifting layout-wise. We chose WordPress as the engine because we were both tired of the difficulties with MovableType updates. After doing those couple sites, I was re-energized about my own redesign. I completely trashed my prior work and started over on WordPress. It took several late night design sessions, rewiring the template, and completely rewriting my CD database, but it’s done. I couldn’t decide whether to redo the templates for the photo gallery or just move that stuff to flickr. I was using FolderBlog previously, but the developer stopped updating the software so I didn’t really want to spend much time with dead software. Then I found a plugin for WordPress that would handle the gallery and use the blog engine for layout. Sweet. And it was easy to make things look similar to the old photo gallery. Cotton-candy sweet! The last thing to do was make my CD database fit the new layout. I wasn’t looking forward to that at all. Then I found some pointers on how to use the WordPress engine to do the layout. Diabetic coma sweet! That part isn’t 100% done yet, but it’s most of the way there. It’s so easy once you get the first couple bumps out of the way. I’m still going to copy all the photo gallery stuff to flickr — mostly as a way to drive traffic here and to mytwincities.net. There’s also a couple new stories, a new entry for the Taxonomy of Rock, and the start of a new series coming in the next few weeks.